U.S. President Donald Trump and North Korean (DPRK) leader Kim Jong Un finally met. The historic summit in Singapore represented the first time the leaders of the countries met in person. There were several meetings between the two leaders. President Trump and North Korean leader Kim were joined exclusively by translators. This represents a significant step away from the standard protocol of keeping at least one aide from each side present at all high-stakes meetings. That said, advisors were permitted to join Trump and Kim in talks for a broader bilateral session. 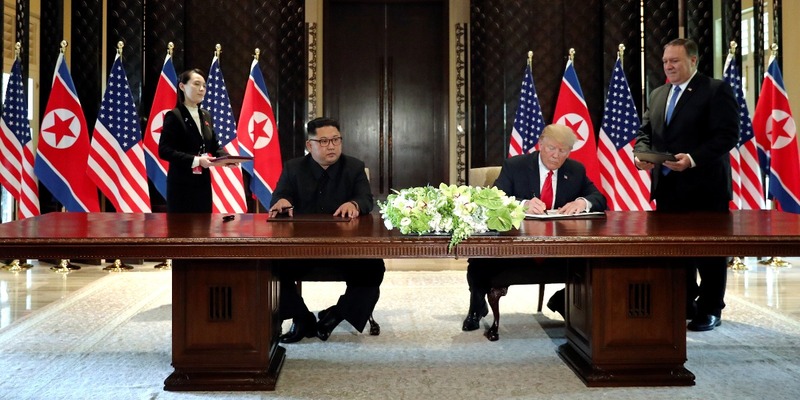 Both Trump and Kim signed a statement to conclude the summit. This statement in which Kim “reaffirmed his firm and unwavering commitment to complete denuclearization of the Korean Peninsula.” On Trump’s side of the statement, he agreed to “provide security guarantees” to North Korea. That said, the agreement does not provide any detail or specific definition to North Korea’s denuclearization or how it may proceed. Furthermore, the agreement also did not make any reference to the massive international sanctions applied against North Korea throughout the time that the country continued its pursuit of its nuclear weapons programme. Furthermore, this agreement was not a peace treaty nor did it make mention of one. As a result, the United States and North Korea are technically still in the same state of war that began during the Korean War of 1950 to 1953. The conclusion of that police action was the death of millions of people and the signing of a truce, not a peace. That said, the agreement did state that both the United States and North Korea would pursue the recovery and reparation of prisoners of war (POW) remains and of individuals missing in action (MIA). Should this result in a lasting end to the warfare state and hostilities between the two countries, it will change the very core of the security ecosystem in north-east Asia. Initially, the response of the British government, the European Union, South Korea, the head of the United Nations, Russia and other world leaders have made hopeful and positive statements with regard to the summit. They feel it is a step in a peaceful direction.